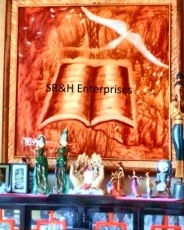 This is the beginnings of a legitamate publishing company underneath the label of SR&H Enterpries, a multifaceted company. The idea is to start small and work one's way upward. What we specialise in for the time being is creative fiction, anything that is provocative, imaginative, and unique, drapped in a seductive romantic appeal. Maybe one day, depending on the collective embrace, we could publish our own anthology. We promise to keep you updated! Don't You Ever Give Up! The Theory Of Evolution Is A Communist Lie! Live Free Or Die, Forever Free! This page was created in 0.7183 seconds.